These twins do vibrate a bit, despite the best effort of the balancer. And the stock grips that came with my 750’s were firm, with almost no vibration absorption. After trying a few different kinds of replacement grips, I’ve come to like two in particular. These are, in my opinion, the best blend/compromise of comfort, appearance, and affordability (in that order). 2.) 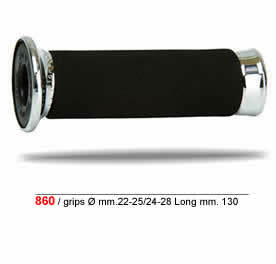 But as much as I like that that old OEM style grip, my favorite for the 750 is: ProGrip Custom Style 860 grip. I get them from Dennis Kirk, but they are available from alot of places. I now have them on both of my 750’s. They have a nice style, a good feel, and they isolate vibrations without being too squishy. A caveat though: after a few riding seasons of heavy use, the foam on my grips was pretty much flattened out, losing most of the absorption and comfort, and requiring replacement. This is not a big deal, since they are only $10 or so… Another interesting facet of these grips is that I was able to remove the foam over the late Autumn and early Spring seasons when I use my Oxford Hot Hands Heated Wrap-Over Grips grip warmers, in order to keep the over-all grip thickness down, but that is another post. UPDATE: This can be tough to install, because they are a tight fit (see comments below). But you *can* get them on all the way if you use a good slippery solution and use lots of force (but be careful not to break the plastic tips off!). 3.) Update, July 2015: Since about mid-2013, I’ve been running the Grab-On MC315 CLAS DLX CHR 6X7/8″ grip on my #2 750… and as I write this in mid-2015, I’m amazed that they are still holding up perfectly, and the foam on the ProGrip 860’s on bike #3 has just about lost it’s absorption. When I first installed these Grab-Ons, I thought they were as thick as tree limbs and were going to be uncomfortable. But they were easy to install, perfect size and fit, hold up well, and in the end, the thickness grew on me since they do absorb vibration very well. I originally bought them from Babbit’s on a sale, but now I’ve found them on eBay for around $28 shipped. Okay, I bought some of these grips, and I cannot figure out how you installed them so easily. The left one I had less trouble with, but it doesn’t slide all the way over. The right one (throttle) was horrible, and now its 2 cm away from where it should be. It looks like if i try to force it more, the silver end piece (plastic) will come off. Ill take a picture to show you if you like, to see what im talking about. As for the size… I know those 860 grips are available in a couple different lengths, I don’t know if yours are the wrong size… (these are listed at 130mm)? Well, at least we’ve warned others to be mindful of the size when they order…. Yeah, im going to have to take it up to the kawasaki dealer and show them. I told the girl at the desk I needed the 860 pro 7/8 which is what i have. But I see there is the 22/25 and 24/28 im thinking I need the 24/28 ones. Either way, still a PITA to install that throttle grip.. sheesh. I tried soap and water, ended up it seemed to help more when I tried the hairspray trick. Im worried if I push it too far tho, ill break the end silver colored pieces off and wont be able to get them back on. I can take pics and send em to you if you like.. perhaps somehow I can attach them for you to see. And I can’t remember where I got the 860 grips I have on the bikes, but the un-installed set I have is from Dennis Kirk, and it is the 22/25 size according to the label… And the 24/28 are problably for 1 inch bars (Harley, etc. ), since 24mm is just under 1 inch. I got the Pro Grips befoer I read this and installed them two weeks ago. I used 50/50 dish soap and water, and swabbed the inside of the grips with that solution, and put 3 rings of spider glue on the bars and throttle grip. The grips slid on without issue, but I had to let them dry over night, now they are nicely glued in place, and they are VERY comfortable. Dennis Kirk has them, but any dealer who sells from parts unlimited can also get them. Well, more like “about Jeremy”… Jeremy replied to me privately that he brought his bike and his not-all-the-way-installed grips to a bike mechanic, who was able to get them on the rest of the way for him. Just got my ProGrips from Dennis Kirk today, 721 Touring Gel grips. I’ll install them and the new Daytona bars after I take the bars to my brother’s to fill them with lead shot. I’ll post more on the subject after I try them out, I’m replacing the black foam grips like in the pic above (because those are to large for my cruise control). Cool… I’ve seen those 721 grips, and they look comfy, but they didn’t look as good for vibration isolation to me… But please report back! 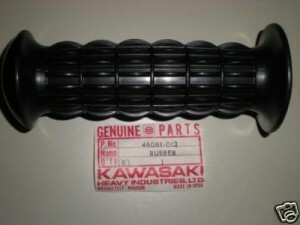 I’ve been thinking about swapping grips to help with the vibration on my ’79 KZ750 twin. What about any solutions to reduce the vibration itself? Keeping my hands from shaking like I’ve been using a weed eater is just one of my problems. The vibration on the left side of my bike makes my left mirror unusable above 4k rpm. I’ve torqued the engine mounts and vacumm synced the carbs. It’s still pretty bad. Any other solutions? Has anybody tried to install some rubber washers at the top engine mount to isolate it from the frame? Would that do anything (good or bad)? 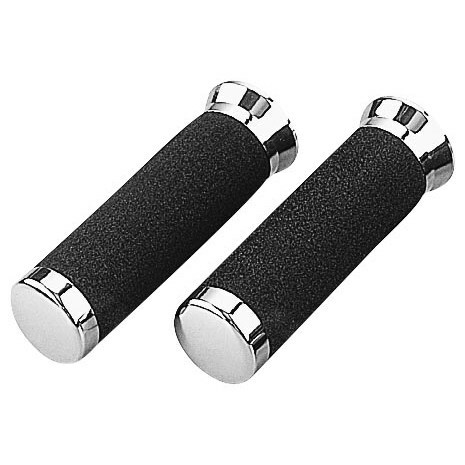 I just replaced my grips with a set I bought at a bicycle store for bicycle racers, $6- and well padded. Look good too. Yep, padding is the key. You don’t want the bzzzzz coming back through the bars.